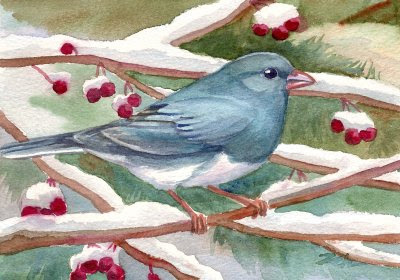 Zeh Original Art Blog Watercolor and Oil Paintings: Northern Junco, "Snowbird"
After doing a painting of tropical flowers (and being in a warm, sunny place in my head! ), I'm now back to the Zeh studio and this is more like what I see out the window! Snowbirds are a constant sight at bird feeders during the winter. But they stay on the ground to eat the seed that's fallen. I don't think I've ever seen one actually at a feeder. This one is taking a break in my crabapple tree. There are still crabapples, amazingly. With all the robin flocks that came through this fall, I'm surprised there are any left. But they will hang there until spring, with a few birds taking a nibble occasionally at the sour fruit, until the robins return in spring to finish them off. Some juncos have a blackish hood, but this one is all slate gray except for the white underparts and tail bars that flash when it flies away.